In 2012 Superior completed an entire retrofit to our Wotan Horizontal Floor Mill. During this retrofit the machine and floor plates were entirely re-machined. After going to this extreme we could not continue without completely replacing and adding 50% more anchoring and leveling components. This machine is more stable and accurate than ever before. We also extended the x-travel limits for more capacity. 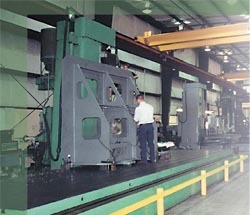 In addition to the major overhaul and retrofit, Superior purchased 2 additional Hurco VMC's and (1) 3-axis CNC Knee Mill. With our goal of continuous improvement we look to add new equipment and tooling to improve our processes to reduce lead times and improve quality. If you have an application suitable to our capabilities, we would like to hear from you.